1. Data: Analytical companies require integrated, high-quality, and easily accessible data about their businesses and markets. 2. Enterprise: Instead of managing their analytics resources in disconnected silos, highly analytical firms manage these resources — including data, technology, and analysts — in a coordinated fashion throughout the enterprise. 3. Leadership: One of the key factors driving success in analytics is strong, committed leaders who understand the importance of analytics and constantly advocate for their development and use in decisions and actions. 4. Targets: Organizations can’t be equally analytical about all aspects of their businesses, so they need to target specific business capabilities and functions to the extensive use of analytics. 5. Analysts: Analytical organizations succeed in part because they hire and train high-quality quantitative analysts and data scientists. More information is provided in Chapter 6. 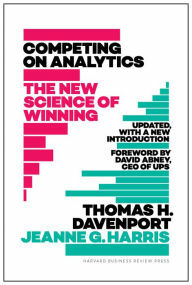 Competing on Analytics: The New Science 0f Winning was published by Harvard Business School Press (September 2017).